Perhaps it's because I'm so used to the routine of sketching then taking the finished sketch up to a painting? Maybe, psychologically for me, a finished sketch is only a half realised artwork that should progress to a painting. Maybe it's just that I spent many years doodling intricate pictures in my school notebooks when I should have been studying? If you're an artist reading this, do you have the same problem with any particular style of art? A style you know you can do well but really don't feel like you've created 'art'. Feel free to comment below. 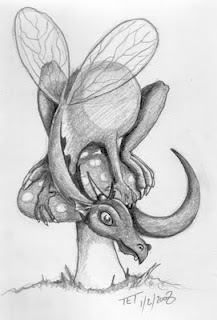 I like this sketch - I think you have a talent for drawing or painting dragons! (I wonder have you tried to draw or paint a 'realistic' type of dragon as against the fantasy type, with flaring nostrils and fire, all scaly-looking etc?) Just wondered how that would turn out. I've saved this one to my comp. It is strange, but when I was at school in my early teens, I always preferred to draw rather than paint. I quite loved sketching. I was quite good at trees, doing individual leaves and gnarled bark etc. I liked to also copy sketched drawings from books, and could copy almost exactly, as I would do it line-for-line, curve-for-curve painstakingly! I also copied cartoons like this, such as the Andy Capp ones, making near perfect copies!